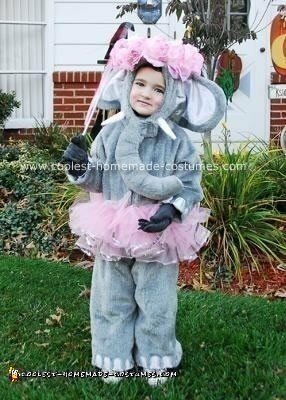 This year (2008) I made my daughter a Ballerina Elephant costume. I live in Ohio and needed something that would be warm for her but also pretty. I got the elephant costume from a sale. I bought the tutu off of eBay. I then bought a bunch of pink roses to match the tutu. I measured around her head making sure I added about 2 inches to the measurement. I then made the wire into a circle. I then took the bunch of roses and cut them off the big stem that they were all attached to. I then cut down the stem leaving enough green to hold onto so I could wrap floral tape around the stem and to the wire. I did this over and over again to make the wreath. I then tied some ribbon to the back so the ribbons would hang down. Once I did all this I sewed the wreath tot the top of the elephants head. Then I found a wand at the dollar store and added ribbons to it to match. I finally took pink lipstick and make two circles on her cheeks. She loved it and she got a lot of complements. It was pretty easy to put together. I thought it turned out great.